It has now been twenty days since I “beat” Pokemon Y. By “beat” I mean, defeated the Elite Four and the League Champion. That’s been what I’ve defined as “beating” a Pokemon game since I was a little kid. Catching them all, or getting into the deep competition meta-game has never been my thing. The Elite Four and Champion of Pokemon Y are entertaining enemies, with theatrics unlike what I’ve seen in past games, though they were pushovers. I feel like Pokemon Y doesn’t exactly know who its for, as the story goes into dark territory, but the characters are so shallow and the writing so dumbed down. That was never more apparent than the end of the game, in which an immortal being interrupts the Star Wars: A New Hope-esque awards ceremony (where your useless friends are celebrated as heroes alongside your character, even though you do all of the work) and challenges you to a battle. The circumstances surrounding the immortal being are disturbing and heart-wrenching, in theory, but your character just smiles gladly and accepts the invitation to battle. The end of the game was entirely underwhelming, and I feel totally okay about expecting more from a Pokemon game, Pokemon Emerald knew how to make the end feel like this big emotional moment, Pokemon Y just spilled all over the place. I find myself wishing that I could just put together teams without doing all of the catching and training. There are all of these teams I’d like to use in online battles, but I am so done with catching and training. Pokemon Y feels like its run its course, for the time being, until I find out how to Action-Replay or cheat my way into building competitive teams. I can’t believe I’m actually writing that, as I’ve always stood my ground about the value of playing Pokemon “the way it’s meant to be played,” but I’ve realized that gets very, very boring, and very, very repetitive. So that being said, this will be the last Nuzlog post for a while. Eight badges in and ready to take on the Elite Four and League Champion, but how did we get here? Well, since last time, I raised a Level 1 Beldum from Japan into a hardy Level 73 Metagross that wrecked shop on the final Gym Leader, Wulfric. Wulfric might be one of my favorite Gym Leader personalities, though I’ve always thought Ice Trainers were particularly well designed. But lets go back a second there: from Level 1 to Level 73 in five days, and that’s not with excessive play either, that took all of four or five hours to do. That’s the speed at which Pokemon can be raised now I suppose, with foreign country, traded, lucky egg, exp. share, and Pokemon-Amie bonuses. I’ve been trying my hand at random online battles, and it’s very addicting. I think after I beat the Elite Four, I might begin training teams specifically for online competitive play, maybe even entering the world of IV/EV training that I don’t care for so much. Since last time, I’ve gotten the seventh badge for defeating the psychic gym leader, Olympia. Kind of a pushover really, since Yvonne rolls with a freaking Umbreon which can’t be hit with psychic moves. Before we could move onto the final badge, victory road, and the Elite Four, we had to take the “Bad Guy” diversion for about two days. What are they up to this time those pesky bad guys? Taking over radio towers? Climate change? Pokemon Kidnapping? Would you believe me if I told you that you had to stop the mass murder of millions of people, and all Pokemon? 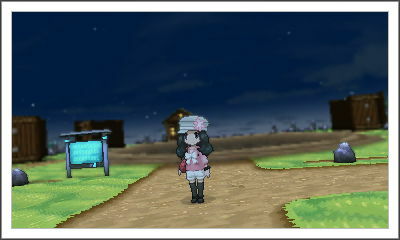 Because check it out, in the ensuing battle with Team Flare, Yvonne stands alone in a town that now sports a giant crater. The story of Pokemon Y is freaking dark and I think it’s pretty cool that Nintendo went ahead and okay’d a story that would bring up World War II themes. There are mushroom clouds, mass graves and everything. I managed to catch the game’s titular legendary, Yvetal with an Ultra Ball, which is nice – it means I can save the Master Ball for Articuno, Moltres, Zapdos, or Mewtwo. Anyways, Yvonne is going full steam ahead into the final gym battle, so let’s see where that team’s at. At this point, if you aren’t on the “Team” you don’t even really deserve mention here anymore. Is that a little sad? Maybe, you might notice that none of my starters are here anymore – Blastoise, Chesnaught, and Blaziken are all gone, phased out and replaced. But that how things go in Pokemon, and eventually this “Team” list of eight has to be sculpted into a well-rounded six. Tough business. 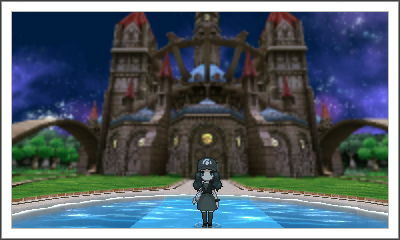 I’ve made Pokemon Y a much more challenging game since the last entry, by sticking with B-Team Pokemon almost entirely. I just got the sixth badge: The Fairy Badge, and now the lines between A-Team and B-Team are being blurred. Blastoise, Chestnaught, and Blaziken; the three start Pokemon I have, have not been used very recently. Heliolisk feels overpowered, but I love him. Meowstic, though not recently used, is definitely a permanent A-Team member. And Umbreon gets to stay on the team because he’s cool, and can take a punch – he doesn’t bring much to the table offensively though. Skrelp, despite being completely under-leveled for the Fairy Gym, used his Poison-Type advantage to great use. He won’t evolve into the Poison-Dragon that I’m looking forward to for a while, but he’ll be worth the effort. Staravia, who I thought was only good for flying, turns out to be a freaking monster, and has evolved into a Staraptor, which looks pretty awesome. Once I got the TM99: Dazzling Gleam; a Fairy-Type move with a base power of 80, I decided it was time to give Floette the Shiny Stone, allowing her to evolve into a Florges. I’m glad I experimented with a Fairy-Type, but so far Florges is really only good for her Grass-Type moves. Hippowdon continues to be an incredibly effective team member, combining Yawn, a Sandstorm-causing ability, and the ever useful Dig. And Axew evolved into a Fraxure today, despite having a very rough time in the Fairy Gym, and quite frankly, getting the crap beat out of him recently. I look forward to having a solid Dragon type, whether that be Haxorus sometime in the future, or Goodra, the evolved form of the Goomy I caught this weekend. …And a Honedge I got from Japan evolved into a Doublade, after taking down a Mr.Mime in the Fairy Gym. This marks the fourth Pokemon that evolved today. …And I went out of my way to catch a Horsea today, because I really want a Kingdra eventually. Basically, challenges are fun, and I’m glad I deviated from the core six of Yvonne’s team. I bought Pokémon Black 2 on Tuesday and it’s been a fantastic couple of days with that game. Pokémon SoulSilver was the latest game in the series I’ve played and I feel like Black 2 has some serious graphical and gameplay improvements. Camera angles will change while walking around the world, the time of day cycle is really nice and the sun flare touches are clever. Pokémon sprites have a nice dynamic animation during battle that can reflect their health and status, and the option to challenge higher-level Pokémon in rustling grass makes leveling up less of a chore. So far, so good, I’m really glad I got the game and it’s making me anxious for Pokémon Y. Otherwise, I’m on the final stretch of summer courses. I’ve got four classes left before I go home in one week, but this is going to be a rough final stretch. I’ve got voice acting to do for an English Literature class, and I’ve never done that before. I have to do a public service announcement voice for a fake PETA video, and I’m looking forward to it but I know I’m going to be a tough critic on my own performance. I’ve got this Blue Snowball microphone on my desk and it looks gorgeous, haven’t used it yet but I have to give it to my partner sometime this weekend so she can record her lines of dialogue. The recordings have to be done by Monday. I have to give a seven-minute speech about the National Security Agency on Tuesday. The recordings have to be appropriately applied to a video on Wednesday and I have to write a three page reflection about the course by Thursday. And finally I have to take a final exam in public speech on Thursday. And on Friday I go home.